Is Facebook effective for B2B lead generation? Today’s Question-MARKeting challenge will be covered by fellow Bentley University Alum Andrew Nadeau. He helped me get my first Marketing job out of college, so I'm extremely excited to have him contribute to my blog. He'll be tackling Kate's question on Facebook for B2B lead generation. Take it away, Andy! "We have a low number of followers on Facebook, it is mostly our employees. As we are B2B company, I often wonder if Facebook is really a good social network to generate leads, and are we wasting our time? I like the fact that we link back to our website in the majority of our posts and I see the value of Facebook for recruiting people to our company but not so much for generating leads. What are your thoughts? BTW LinkedIn works well for us as a lead generating source." "Our team needs to optimize for International SEO, and without the proper research, we'll never unlock the key to finding keywords!" "How can you expect website lead conversion to succeed without first analyzing your sales process and buyer personas? YOU NEED A SMART MARKETING PLAN OR THOSE WEBSITE VISITORS ARE GOING TO BOUNCE!" "Thousands of students are coming to the CIS Sandbox each semester. Fewer regularly read the blog beyond the first page, which has frequent posts from student workers about IT topics, tips on homework and more in order to keep it fresh. We are looking to enable opening commenting on the blog to members of the Bentley community and hope to have that in place shortly (there were some technical issues to overcome). The CIS Sandbox has a presence on Facebook and twitter. What else should we do?" "How do I maximize aggregation of inbound SEO authority across bundled domains (various intl tlds e.g. www.TraceDetection.com.ng, .com versions & affiliated web properties) to leverage common blog content and authority?" Very good question. Perhaps too good. 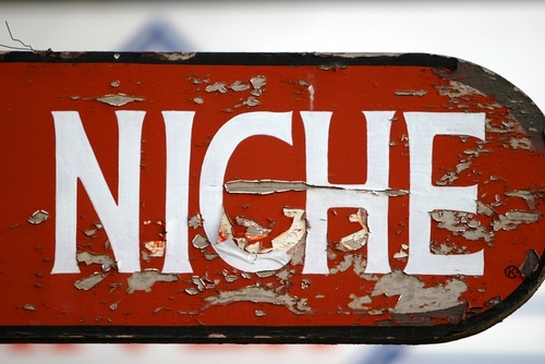 The Key to Finding Keywords: Stop Going Niche, Capsice? Alright, I'll admit it-- the blog post title is too creative for its own good. And it might not make much sense. But it includes a keyword I want to rank for (which isn't 'Capisce', believe it or not), so let's just casually move on to my latest marketing challenge from Eric. Ah, the ol’ “niche keyword” conundrum. You want to drive traffic to your website through keywords that describe your product or service, but after doing some research, you come to find that nobody is searching for the terms. In school, I loved numbers. Despite tenth grade trigonometry (the teacher had an inexplicable vendetta against me), every math or science class I took was better than the last. I even did Math Olympiad in sixth grade, which was probably a contributing factor to my inability to associate with girls until high school. Growing up, I also had a passion for art. My father is a commercial artist turned children's book author and illustrator, so I was subject to much creativity during my early years. Having a deep, mysterious artistic side negated out the nerd-factor of math, contributing to me getting a girl friend in high school. Ying and yang, blog reader. Ying and yang. Want meatier website leads? First, you gotta try the ToFu. Seriously. Despite the title, I'm going to start this one off with a fishing analogy (which happen to work particularly well when describing Internet Marketing). Okay, so imagine your friend just told you that he was at this lake yesterday where he caught fifteen rainbow trout. This was the exact type of fish he was looking to catch too, which is great. You want to catch the same type of fish too, so you ask him where the lake is. He gives you directions and the next day you pack up your equipment (which is quite the endeavor since you need to prepare the rods, your tackle box, need to pack your lunch, etc.) and head out. Your morale is high though, so you overlook the fact that you could only pack peanut butter and jelly for lunch. "We have a small online store using Volusion template. Business is small and steady. Sales are 80% to university research labs and 20% to research labs in the private sector and government. We tried direct email marketing using Constant Contact and the stuff we put out was pretty good content-wise. It resulted in absolutely no increase in sales - zilch, nada. Don't know why. We expected some increase but there was nothing. Wondering why direct email was such a failure." SEO. Huh! Yeah! What is it Good For? Absolutely nothing? Far from it. However, the SEO landscape is changing so rapidly, that's tough to keep track of it (let alone ensure that you're optimized following the most up-to-date best practices). There's a good chance a website that was considered well optimized a year or so ago no longer is (provided nobody has updated it since). But it's frustrating when a relatively new site isn't getting found for the keywords you desire. Today's post is written for Frank, who's having some SEO struggles. He asks: "The Amodio & Co. Real Estate website isn't getting found on search engines, even though we included keywords, why is that?" In this Marketing Challenge post, I'll be covering a blogging and SEO question submitted by Nicole of Nicole Chan Photography. If you'd like to be featured in an upcoming Marketing Challenge, you can sign up here. She asks: "What's the best way to SEO-juice up my blogpost and images in my blogpost?" To me, a business website is a very exciting thing. It's essentially a digital sandbox to create an online experience for your potential customers. It has the capability of getting you found on the Internet, teaching said potential customers about your product/service and beginning a business relationship with them. If done right, a website can be a VERY effective tool in growing your business. As a digital marketing consultant, I see a lot of websites. While most of my consulting recommendations are based on marketing goals and the required steps needed to achieve them, a majority of this feedback involves some part of the client's website. As you can imagine, I've witnessed my fair share of website initiatives and how successful they are at achieving a client's business goals. What follows is a list of website faux pas that in my opinion, detract from a website's ability to foster business growth. Is Your Website Dropping the Ball?